According to "Gray & Meyer: Analysis and Design of Analog integrated circuits" transistor current gain Beta (in forward-active region) depend on operating conditions of the transistor. Region 3 is the high-current region, where β decreases as Ic increases. While ideally β is always constant. Why does this "effect" occurs? 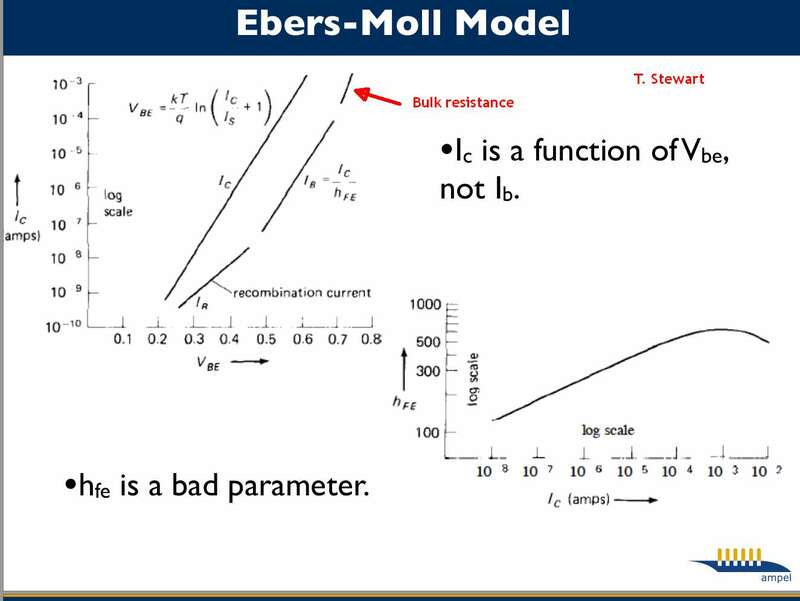 Is this β dependence on operating conditions significant when talking about small or large signal model? "On the Variation of Junction-Transistor Current-Amplification Factor with Emitter Current," by W. M. Webster, Proc. IRE, Vol. 42, pp. 914-920, June 1954, is the seminal paper on this topic. I've written about these effects before, here. But not directly, just as an aside. These were later (after the above paper) discussed in literature from the 1960's and 1970's typically as "Region I," "Region II," and "Region III." Region I is pretty much guided by additional factors related primarily to the base current and Region III results from changes in the collector current. the recombination of carriers in the emitter-base space-charge layer. In Region III, the injection of minority carriers into the base region starts becoming increasingly important in comparison against the majority carrier concentrations. Because the space-charge neutrality is maintained in the base, the majority concentration has to increase by the same amount. The other factor in Region III is, of course, an 'Ohmic resistance' and is already modeled as \$r_c\$ so it isn't included above. A model constant is usually applied to the above equation and the resulting term then appears in the divisor used for the usual model saturation current equation. The main reason current gain is never constant is because it is actually Vbe controlled Ic current on a log scale and thus current gain is nonlinear in 3 regions. 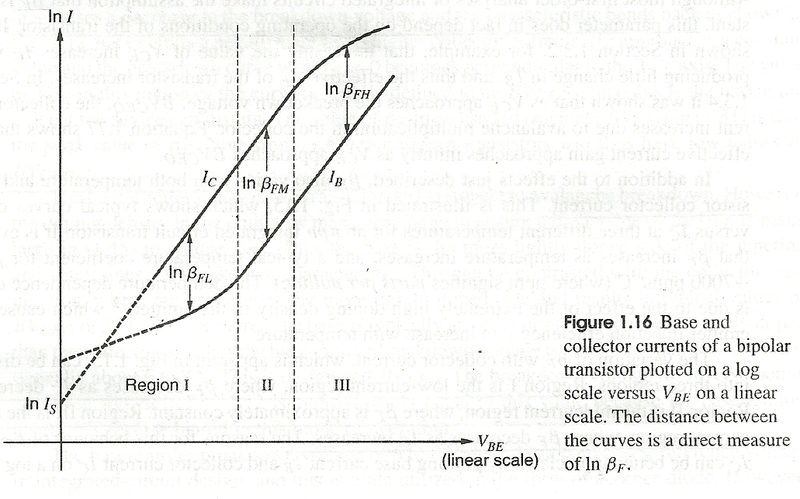 It is specified in Region II unless curves are supplied, which are becoming less common in datasheets. Thus hFE (DC gain) and Hfe (AC gain or incremental small signal) are approximations. DC current gain hFE spans a 3:1 range in Region II in production unless sorted into bins. So because of this we choose feedback ratios for Rc/Re or Rf/Rin to control voltage gain, due to wide spread of current gain. Saturation Effect reduces hFE to about 10% at Vce(sat) near rated current. Saturation also rises with Ic but generally seen for Vce<2V where linear sinusoidal gain begins to start asymmetric peaks or %THD from reduction in current gain. Not the answer you're looking for? Browse other questions tagged bjt npn gain or ask your own question. 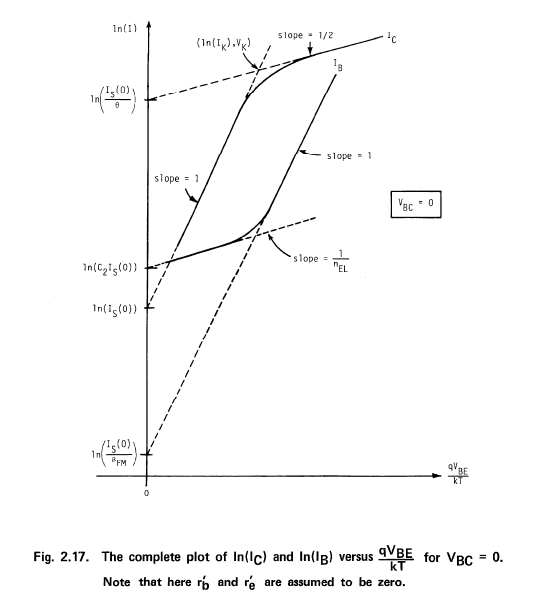 Why is Vbc absent from bjt equations? what is normalized transconductance uesd for? Why is Ib proporional to Ic in a bipolar transistor? Does Vbe remain constant when Vb changes but changes when Ve changes for this BJT biasing circuit? Voltage divider bias (BJT) leads to a huge voltage drop across the collector resistor. Why?